In a series of dramatic political moves, the Libyan General National Congress on Tuesday carried out a vote of no confidence in Prime Minister Ali Zeidan. 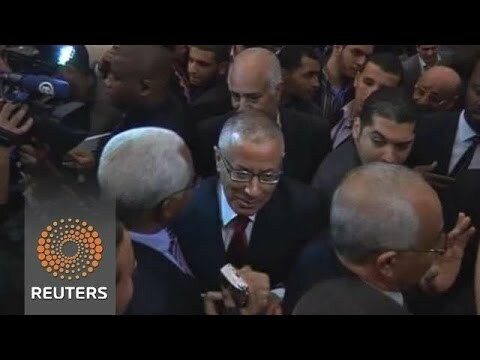 Zeidan, identified as a liberal nationalist, has been targeted since his election in 2012 by the Muslim Brotherhood bloc in the elected Libyan parliament, but they had lacked the votes (120 out of 194 members of the assembly) until now. The Muslim fundamentalists were clearly joined in this vote by liberals or nationalists who had grown weary with Zeidan not on ideological grounds but because he was seen as increasingly ineffective and perhaps corrupt. Libya now risks fighting between militias loyal to the central government in Tripoli and the rebel autonomists in the east. It also risks a coup by Muslim fundamentalists in parliament. The trigger for the vote of no confidence was the taking of three ports in the east of the country by rebel autonomists and their capture and launching of a North Korea-flagged oil tanker by the regional rebels, despite central government opposition. Eastern separatists or autonomists are not a majority in that part of Libya, and crowds have often mounted big demonstrations in Benghazi and elsewhere in favor of national unity. But given the lack of central authority and the inability so far to rebuild a national army, even small militia forces in the east have been able to act with impunity. Zeidan was unable to restore security in the country, with militias acting increasingly lawlessly (last fall a militia briefly kidnapped Zeidan himself but then let him go). His inability to keep order began affecting oil receipts, the primary source of income for the government and the country. Some facilities were paralyzed by strikes by oil workers, who maintained that they had been poorly paid in the Gaddafi era and that their situation had not improved after the revolution. In other cases, regional autonomists from the east took control of oil facilities, maintaining that their proceeds should go to the eastern region rather than to the center. (Libya is historically divided into Cyrenaica in the east, Tripolitania in the West, and Fezzan in the southwest, but has been ruled as a unitary, non-federal state for many decades; the Gaddafi dictatorship deprived the East of resources because it had a feud with Benghazi and other eastern cities, centers of Muslim fundamentalist politics that opposed Gaddafi). Zeidan fled to Malta in a private plane, refueled, and at last report was on his way to Europe. The General National Congress replaced him temporarily with Defense Minister Abdallah al-Thinni and announced elections for a new parliament within three months. Zeidan and his faction had attempted to keep the present parliament in place until late 2014, despite a February 2014 deadline to finish drafting a new constitution and begin holding new elections. The parliament held national elections in early February for a distinct constituent assembly that will draft the constitution. It saw only an 18% turnout; there was fair security for the vote, though a few polling stations could not open because of violence; but the public is just weary of the political infighting and gridlock in high Libyan politics. Al-Thinni now has the task of accelerating the rebuilding of a national army, of finding a compromise with eastern autonomists or of finding a way to defeat them, of moving toward new elections. While the situation in Libya is a mess, it should be pointed out that it is a real achievement that the country has an elected parliament and an elected constituent assembly to draft a constitution. It is an achievement that parliament can remove an ineffectual prime minister with a vote of no-confidence. Since the founding of the modern state in the early 1950s, Libya was either ruled by fiat by a king or a dictator. It had too much order and too little social and political development. Critics of the head of state were arrested in the middle of the night and tortured and then plowed into mass graves. Now, Libya’s parliamentary politics may be no-holds-barred, but the members were freely elected from local constituencies and the prime minister can be unseated with a vote of the people’s representatives. The government is too weak and national unity and the economy are threatened as a result. But as long as representative institutions can function and improve over time, there is some hope for the future. Those who think Libyans were better off under a cruel and arbitrary and frankly mad dictatorship are badly mistaken and should examine their moral compasses.